On Thursday evening December 1, 1955, after a long day of work as a seamstress for a Montgomery, Alabama, department store, Rosa Parks boards a city bus to go home. Tired as she is, Mrs. Parks walks past the first few  mostly empty  rows of seats marked "Whites Only." It's against the law for an African American like her to sit in these seats. She finally settles for a spot in the middle of the bus. Black people are allowed to sit in this section as long as no white person is standing. Though Rosa Parks hates the segregation laws, and has been fighting for civil rights at the NAACP for more than 10 years, until today she has never been one to break rules. The bus continues along its route. After several more stops the bus is full. The driver notices that all the seats in the "Whites Only" section are now taken, and that more white people have just climbed aboard. He orders the people in Mrs. Parks's row to move to the back of the bus, where there are no open seats. No one budges at first. But when the driver barks at the black passengers a second time, they all get up. . . except for Rosa Parks. 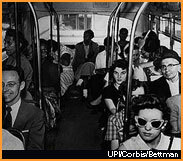 Was Rosa Parks nervous standing her ground? Find out from Mrs. Parks herself! She explains how she felt on the bus that day in her interview.